Call Us: 1-866-POTTERY (768-8379) Custom Architectural planters and accessories for the trades. Pictures with prices are available overstock or scratch/dent units. If not available no price will show.. send fax or email...INQUIRE. N=new G=minor blemishes F=fair-good some minor blemish,tarnish or finish wear. ** Some pictures not actual unit...ask and we will shoot a pic and email to you. 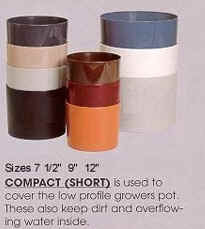 PLASTIC PLANT POTS - MANY ASSORTED COLORS AND SIZES AVAILABLE - INQUIRE. BRASS PEDESTAL PLANTERS (NA) POLY TREE POTS (1) LARGE 36" TC COLOR. THE AVAILABILITY OF PLANTERS BELOW ARE TENTATIVE - RESERVE IF YOU WANT SOME - WE WILL ADVISE. SALE PRICE: EACH - TOTAL THIS IS ABOUT 40% OFF - NO MINIMUM! see what you need or see menue on left of pages..
One of our business ventures involves the leasing or renting of Plants and Interior Plantscaping planters, pots and accessories to large Corp clients, hospitals, hotels and offices as well as some high end homes. After a while the account is closed, rentals get a bit aged looking or just downright tarnished and rough. While these plant containers may no longer be sharp enough for the atrium building or lobby of a grand hotel, they look great in many home designs. If you like the antique look or just love a really great deal, you will love these...50% - 90% off ! INQUIRE !We have inventory, just not always the time to update. Let us know if you want to consider a "Treasure Pot" item for your needs and we will advise if it's available, how many on hand and price. Treasure pots is changing all the time... you will need to be fairly quick because of the limited quantities. Check back often. Important: Because of the seriously discounted prices there can be no returns or exchanges on sales from this section. Sales are as - is and final. We will send pictures (if not already posted) on request and a good - honest evaluation of condition and appearance. © 2004-2019, GoodieStore, Inc. and PlanterDesigns All rights reserved worldwide.